"The gates of hell are unlocked." 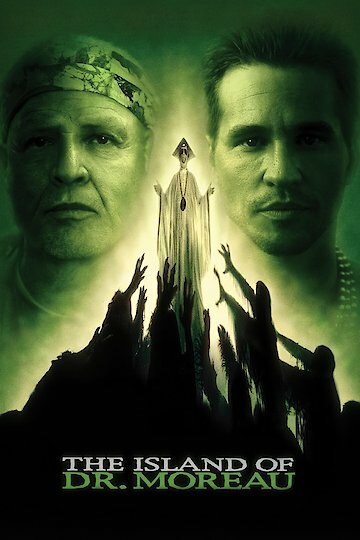 The Island of Dr. Moreau is a 1996 film starring Marlon Brando, David Thewlis, and Val Kilmer, based on the novel by H.G. Wells. In it, Brando plays Dr. Moreau, a scientist who is trying to combine the DNA of humans and animals in an effort to create an invulnerable being but who at the time the movie takes place has only succeeded in creating creatures who appear to be half human and half animal. The story is seen through the eyes of a UN negotiator whose plane crashes in the ocean and who is then rescued by a ship that brings him to Moreau’s island, where he is held prisoner. The man encounters the half-human, half-animal creatures, and Moreau reveals the nature of his experiments and his plan. As the movie progresses there is conflict between Moreau and the UN negotiator, and also between the humans and the half animals, who without the continued use of drugs will begin to regress into their animal forms. The Island of Dr. Moreau is currently available to watch free on Vudu Free and stream, download, buy on demand at Amazon, Vudu, Google Play, FandangoNow, iTunes, YouTube VOD online.